have you ever considered to integrate nanofiltration (NF) in your milk, whey or juice production process, but until today you are not sure if there are real benefits to it? Then let me visualize them to you in this short article about the basics and benefits of this processing type. So what is NF all about? With the help of NF it is possible to concentrate certain substances/contents of fluids. 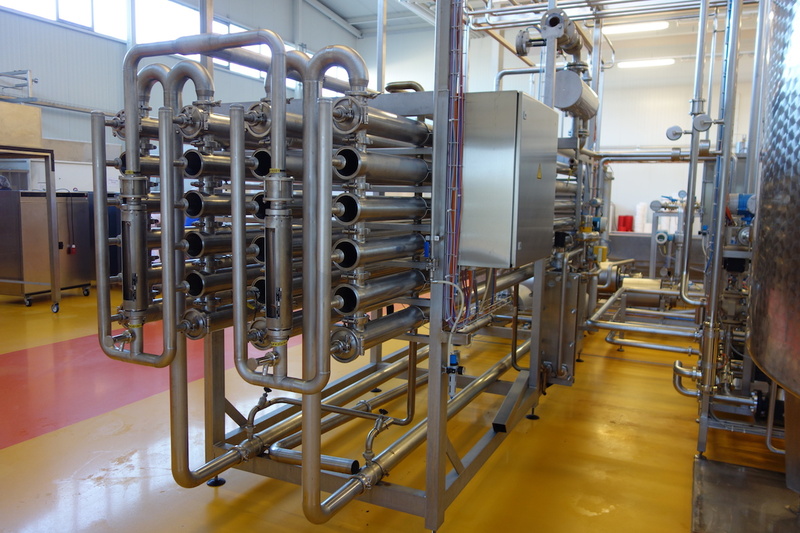 NF is a pressure driven membrane process which is meanwhile a widely used and renowned processing type within the foodstuff and beverage industry. Especially the dairy industry discovered nanofiltration for itself in order to recycle by-products like whey for example. The actual functional principle is as follows. On one side of the membrane (a semi permeable wall) pressure is built up. This leads to the fact that the fluid, e.g. whey, is pressed against the wall so that only simply charged ions diffuse through the membrane. The substance passed the membrane is called permeat. The other substances/contents of the fluid (multiply charged ions) which are held back because the membrane does not let them pass is called retentat and equals the concentrate. The pores of the membrane are so small that it holds back particles with a diameter of 1 nano meter (nm) and smaller. This list does not claim to be complete, but it shows that NF can be applied to produce a wide range of products. Especially mid-size and big companies do benefit from the use of NF because it helps optimizing the profit situation. It is especially a very good alternative to concentration through evaporation because the acquisition costs are conciderably lower for a NF plant. Above that evaporation is a much more energy intensive process and last but not least a NF plant is much more easier to integrate into an existing business because of its advantageous size. Another great advantage lies in the use of ultrafiltration (UF) permeate. With the help of NF you can concentrate and partly demineralise your permeate in one single process step. So if you have UF permeate which remains unused you should definitely think about the integration of NF in your process in order to generate extra revenue with the sales of processed UF permeate. When you are already producing or think about producing whey powder, NF is a solution which you should use to improve your product. It is not a secret that whey powder which is won out of pre-concentrated respectively pre-treated whey is more valuable and of higher demand than a product which did not run through NF. Finally, NF is a purely physical separation process. That means a chemical/thermal modification of the components to be separated is unnecessary. As you can see, NF is a process with manifold benefits. Especially the aspect that it has high potential to improve the profit situation is a highly considerable argument. Important to acknowledge is that NF is a good alternative to evaporation in terms of cost-effectiveness and product quality.